Spay and neuter services can reduce the number of feral and free-roaming cats, but the invasive procedures are expensive and require a high level of veterinary training. Researchers have considered an injectable contraceptive vaccine—GonaCon—that has been shown to be effective in several mammals, including deer, horses, and laboratory-raised cats. But field-testing such a product is complicated. That's why a group of University of Illinois researchers created a unique study environment designed to bridge the gap between the lab and the real world. In short, it's a cat wonderland in which resident cats help to advance science. "Many facilities have come a long way in making research conditions more humane for the animals, but they still involve small enclosures without a lot of enrichment," says Amy Fischer of the Department of Animal Sciences at U of I and lead investigator of the study published in the Journal of Feline Medicine and Surgery. 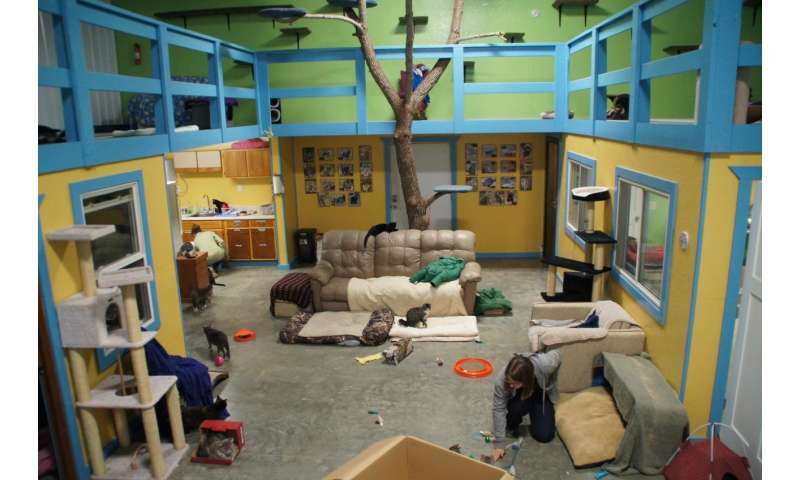 "We wanted to make our cats' environment much more stimulating." A pole barn was built to house the 35 cats in the study. In a unique approach, the facility was dual-licensed as a USDA research facility and an Illinois Department of Agriculture animal shelter. With a giant climbing tree in the middle, the completely open structure had two levels, furniture, toys, scented objects, myriad hidey-holes, and a quarter-acre outdoor enclosure. Enrichment also included interaction with student volunteers, who played with and trained the cats to feel more comfortable with veterinary exams and procedures. "The cats got pretty used to going to the exam room; they'd just lay back for ultrasounds," Fischer says. "That conditioning for cats, going through medical procedures and getting accustomed to cat carriers and wearing harnesses, really helped when we adopted them out at the end." Female cats were allowed to intermingle and breed with the five males as they would in natural conditions. The majority of females (20) were treated with GonaCon, but 10 others were left untreated for comparison. Unlike previous studies that relied on genetically uniform laboratory-raised cats, the cats in this study came from local animal shelters, making the population more realistic. "It was important for us to recruit cats that didn't have very favorable outcomes, including high-risk cats that were probably going to be euthanized at the shelters," Fischer says. "Part of our big picture was to bring in cats that didn't have good possibilities elsewhere." Ultimately, as reported in a separate Journal of Feline Medicine and Surgery study, the vaccine was not effective in preventing pregnancies in this population. Sixty percent of treated females were impregnated within a few months of receiving the vaccine, and an additional 10 percent became pregnant within a year. Because of the low success rate in the first year, the study—planned for five years—was scrapped early. Fischer says new contraceptive technologies are being developed, and suspects she'll use the hybrid research/shelter facility again in the future to test them. By then, the facility may not be the only one of its kind, as several researchers and shelters have inquired about the design. Fischer says there are lessons from the study for any cat lover. "Cats are far more complicated and intelligent creatures than a lot of people realize. To see them respond to our training and really thrive with the enrichment we offered was very rewarding. I'd encourage anyone who has cats to think about what they might need in their environment to live a richer life. And always, always spay/neuter. Please."